No more green water with MICROBE-LIFT/AlgAway 5.4 Algaecide! This product is used in self-contained ornamental ponds and fountains without any outflow. 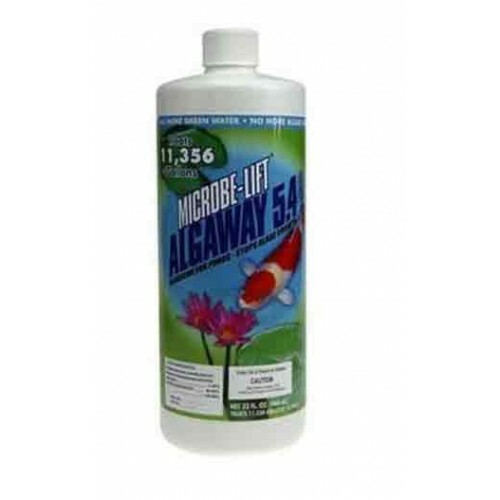 With small ponds that have heavy algae growth clean the excess algae off sides and ornaments before adding MicrobeLify ALGAWAY 5.4. This will reduce the amount of decaying organic matter. For fountains and small ponds with Koi or Glodfish treat only water that will NOT have outflow after treatment. High water temperatures will cause higher levels of decaying algae which can cause stress to livestock. If animals are present remove excess algae and treat before water temperature reaches 75 F of 24 C. Only use in a well aired pond with a contentious air supply. 32 fl oz. of Algaway 5.4 Treats 11,356 gals. In ponds, insure that water is well aerated via waterfall, fountain or other method to prevent fish loss. Not safe for use with snails, shrimp and other crustaceans or mollusks.